Love is a feeling that you can’t describe in a word, not really. That is the real reason, Joel Horwood’s quirkily beautiful new piece argues, why we draw anatomically inaccurate symbols on Valentine’s Day cards and tacky tourist T-shirts. We struggle to say it in words, so we make it into a picture. The love that Horwood’s play paints is romantic love, parental love and the strange, unconditional love mingled with hate that we often feel for the place we come from. In the unlikely surroundings of Peterborough’s cul-de-sac ridden suburbs, Michael – or, as he’d prefer us to call him, Lulu – applies his lippie and slips on his ruby red heels. He is in pursuit of love and happy endings, but that love arrives in a somewhat unexpected package when his teenage son Hew arrives at his doorstep. As the ruby slippers hint at, for Lulu and Hew there’s no place like home. Their small, chintz-decked abode is a refuge from the jeers and stares of the town, of the eyes that would “take bites” out of them. Within this gaudy sanctuary, father and son work on a double act, escaping the world’s cruelties through the retreat of music. 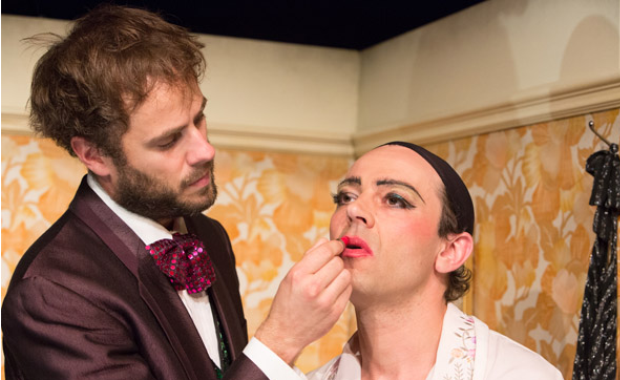 Jumping off from this platform, Horwood, who also directs, is able to flirt playfully with form, clashing drama with cabaret and throwing occasional meta-theatrical winks to the audience. A keyboard sits at the back of the performance space, at which Jay Taylor’s awkwardly gentle Hew plays musical accompaniments and lends his voice to Lulu’s stories. It is these stories which form the real heart of the piece, with Milo Twomey’s warm, overtly theatrical presence as Lulu spreading across the stage. Yet beneath the brash persona there is a strain of brittle vulnerability and viciously protective violence, a violence that is reflected in Horwood’s words. Love is often meshed with pain, with fists and bites, while recurring interruptions remind us of the people blowing each other up around the globe at the same moment the onstage events are occurring. It is a shade of darkness pasted with glitter that colours the entire piece but is not fully interrogated. Tenderness, it is perhaps suggesting, can never come without scars. Horwood’s writing offers up phrases like candies, sweetly rolling on the tongue. He is a creative master of the simile; love feels like “driving over humpback bridges too fast”, while a girl’s face “trembles like a pond”. Grit-flecked poetry is crafted from the soulless concrete, proof that anything can be beautiful if it means enough. In this way, Peterborough slowly becomes a mirror for these two damaged inhabitants. They might be odd and occasionally ugly and difficult to love, but the possibility for love still remains.